As we continue delving into how you find the perfect sleep away camp for your child it is definitely advantageous to get the ‘inside scoop.’ Once you have narrowed down your camp list to your top two choices talking with parents and campers is a great way to figure out which one is the perfect fit for your child. Word of mouth referrals give a real perspective of a camps culture and value. Candid conversations with current parents can help you to get a real feel for the place and the people. S’s highlight was water sports, particularly the “dot,” sailing, and tubing. She also loved tennis, archery and riding. She also loved meeting new people, being mixed up at mealtime at different tables. She loved making connections with older campers who had written to her as pen pals a great tradition. Being white team captain (and all the other amazing camp experiences!!). As always, she is still talking nonstop about all the fun she had. Both our girls seemed to have fully inhabited the physical space of camp. The freedom to do so much good healthy stuff all day long was fantastic. Ropes course and waterfront were much talked about. She loved all her counselors. Her cabin mates, she had a blast and has made incredible lifelong friends. It’s really special we are so grateful. She was so excited about sailing. She drew us diagrams and explained all the terminology. She enjoyed all the activities and the girls with whom she shared the experiences. For me, it was great fun to see her participating in a sailing major this session. She loved getting to know the girls in her shack. She came home with more independence with personal care. Greatly appreciated the quality of the counselors and their simultaneous focus on girls and readiness to reassure if I was worried. Definitely improved her swimming in the 12 days of camp, which we appreciated. She benefited from tennis and riding instruction as well. I am SO impressed with the academic caliber of the counselors. They are obviously intelligent in academics and also have a generous spirit to share with their girls. She had a wonderful experience gained independence and increased confidence. As she enters 3rd grade she is really showing a sign of maturity that she hadn’t last year. I do believe it is part from her experience at camp. Communication is EXCELLENT in all areas. I am always confident that T is safe, happy and in good hands. Any and all communications have been clear and prompt, whenever we have needed extra help with our girls in particular it has been handled incredibly well. If you want a copy of our current family reference list so that you can get the inside scoop give us a call 207 495 2228 our parents are happy to chat about why they continue choosing Camp Runoia for their daughter. 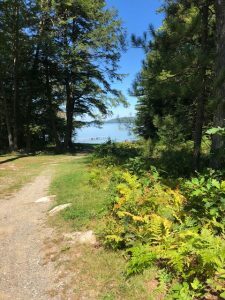 The path to the lake at Camp Runoia in Belgrade Lakes, Maine.